You know what this means…. 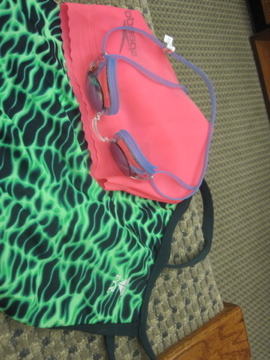 I swam!! I finally got over my fear of swimming and just went for it. I was never on swim team , so although I was taught the basic strokes at summer camp I don’t feel confident in the water at all. But everyone starts somewhere so I after work I drove over to my gym, which also has an outdoor pool. Luckily most of the sunbathers were gone at the point so I was a little less self-conscious. I started with two laps with a kickboard which is a lot harder than I thought. I then swam 10 laps of breast stroke, 10 laps of free-style, and then 10 more laps of breast stroke. I cooled down with another 2 laps of kickboarding. If someone wants to translate that to swim-speak for me, feel free. Free-style is not my strength. I felt like I could never get good breaths and I don’t know how to pace my kicks with my arm strokes. I had to take a break after each lap of free-style. I could do the breast stroke forever. It’s nice and slow and calm. I still get foot cramps in the water, especially when using a kickboard. I’ve always had this weird thing where my feet and toes cramp up in the water…no bueno. But now that I’ve gotten my first time out of the way I’m excited to go back and try to make some progress. YAY swimming! I really wanted a smoothie for dinner tonight. I was *this* close to just being boring and having the same meal I had last night, but then I remembered the big container of veggies in my produce drawer and the leftover vinaigrette that was about to go bad. 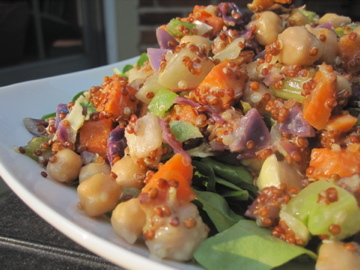 So instead of a smoothie, I created a grain and bean salad that was packed with nutrients! First I cooked 1/4 cup red quinoa on the stove and steamed 2 cups of Trader Joe’s chopped veggie mix. 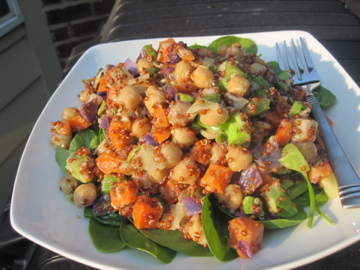 When those were finished, I combined them in a bowl and added 1/2 cup drained and rinsed chickpeas. About 2 tablespoons of my leftover jalepeno cilantro vinaigrette from Crazy Bowls and Wraps got mixed in and I placed the bowl in the refrigerator to cool for a few minutes before serving it on a bed of spinach. So good! The jalepeno cilantro vinaigrette is my all-time favorite dressing. I really need to ask them for their recipe. And I love that this meal packs a protein and veggie punch. 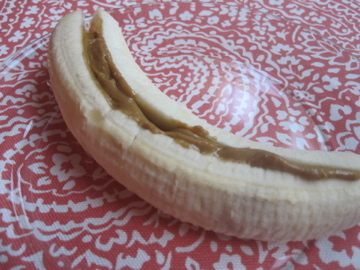 One thing I did repeat from yesterday was a nighttime snack of a banana with Sunbutter. I love the combo of the salty butter against the slightly sweet banana. And again, it prevents me from going overboard with the sugary snacks! 1. The skirt I wore today is from Forever 21 a few years ago. Glad so many of you liked it! 2. I get a decaf Americano because Starbucks doesn’t brew iced decaf coffee. It doesn’t taste much different than regular coffee to me. And it comes black so you can add milk or sugar, but I don’t. 3. Sometimes I spell my own name wrong. Are you a swimmer? Any tips? That’s awesome, re: swimming! Congratulations! For cramps they’d tell us we were getting them because we were lacking potassium. Which is weird since you eat bananas daily– right? Well, after I’d get a cramp they’d give me a banana. Hehe. Yay for swimming! I swam competitively for 10 years and am just getting back in from taking a nice 6 mo out of the water. Just kick you legs at an even pace for free and make sure you’re blowing all your air out between strokes (I have also been coaching for 4 years and this is a very common breathing problem) good luck with your swimming you’ll do great!!! You are so brave!! Swimming is on my list of things to tackle before I turn 30 in October. I just need to face the fear. And I’ve been eating bananas with almond butter sprinkled with cinnamon for nighttime snacks. So good! Someday, I do really want to learn how to swim, though! I didn’t know that you could order a decaf Americano! I always thought that they only used espresso to make Americanos. Good job with the swimming!! One of my goals for the summer was to get back in the pool, because I love the feeling of exhaustion in my entire body after a good swim. I feel exactly the same way about free style. I can NEVER get enough air in and I get worn out. A few years ago I got certified as a lifeguard for a summer camp job and the number of laps we had to swim in a row almost killed me! Oh man, I am not a swimmer, but i’ve tried! my left shoulder often locks when i swim and i end up just sinking to the bottom. Not the most reassuring thing people like to see…haha! oh, and this might sound crazy but wasn’t it fun experiencing an earthquake! i’ve been through more than a few living in Southern California and always find them fascinating! I’m actually kind of scared of swimming too! So awesome that you went for it… I have a pool at my gym that I never use but maybe I will soon! Good for you for trying out swimming! I’m a swimmer, though I haven’t done it in a while. Like what others are saying, breath out while you are taking strokes, and then turn your head and breath in. For the cramps, maybe try stretching in the water after your warmup. My muscles are always stiff, so a bit of stretching makes a big difference for me. I ALWAYS get foot cramps when I swim! That’s the main reason I never embraced swimming, as it’s absolutely no fun to endure alien toes while trying to enjoy the water! That banana should help, tho, typically cramps come from a lack of potassium. All I can say is that my body must be a desert of dried up potassium whenever I swim, because nothing else in this world is guaranteed to make me cramp up like kicking in the water! Best of luck to you on the swim thing. If you find the cure for the cramping, let me know! Very impressed with the dinner that you pulled together! (I’ll admit that I did have a smoothie!) But that looks so yummy! Maybe I’ll be ambitious tonight! I’m at swimmer at college and have been all of my life! 34 laps is a little over a half mile and is GREAT for someone just getting back into it! Keep it up-it will get easier!! Haha that’s great Claire…for an awesome ab/shoulder workout, give Butterfly a try!